Gold prices rose $5.97 an ounce on Wednesday, breaking a three-session losing streak, as the dollar tumbled from two-week highs after Federal Reserve Chairman Jerome Powell said interest rates “just below the broad range of estimates of the level that would be neutral for the economy”, stoking speculations that the U.S. central bank is closer to the end of its rate hike cycle. Gross domestic product increased at a 3.5% annualized rate, the Commerce Department said in its second estimate of third-quarter growth. The Commerce Department also reported that sales of new homes declined 8.9% to a seasonally adjusted annual rate of 544000 in October. Traders will be eyeing minutes of the Fed’s September policy meeting, due to be released later today, for more clues on the central bank’s monetary tightening path. XAU/USD revisited the 1225.30-1224.80 area as anticipated after prices climbed back above the 1220.50 level. 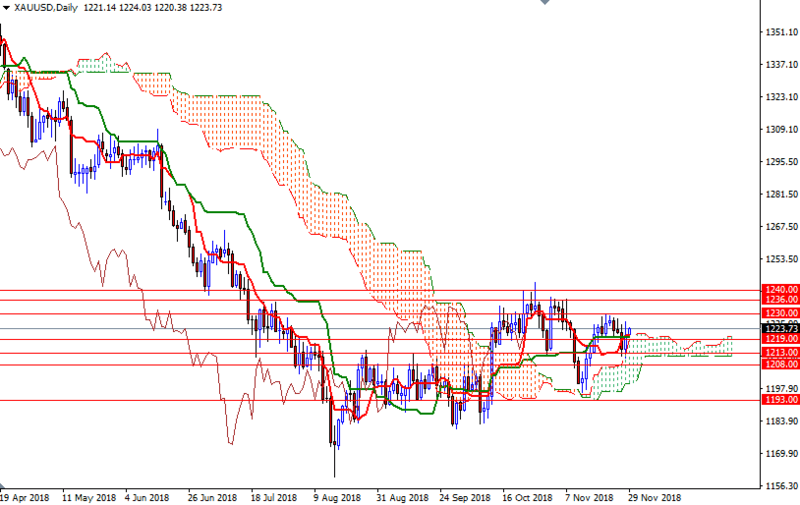 The market is trading below the Ichimoku clouds on the H1 and the M30 charts, suggesting that the market will try to pass through 1225.30-1224.80 again. If the bulls penetrate the 4-hourly cloud and take out yesterday’s high, we may test the strategic resistance in 1232/0. Beyond there, the 1240/36 zone stands out as a solid technical resistance. However, if prices remain within the borders of the 4-hourly cloud, keep an eye on the 1222-1221.30 zone. 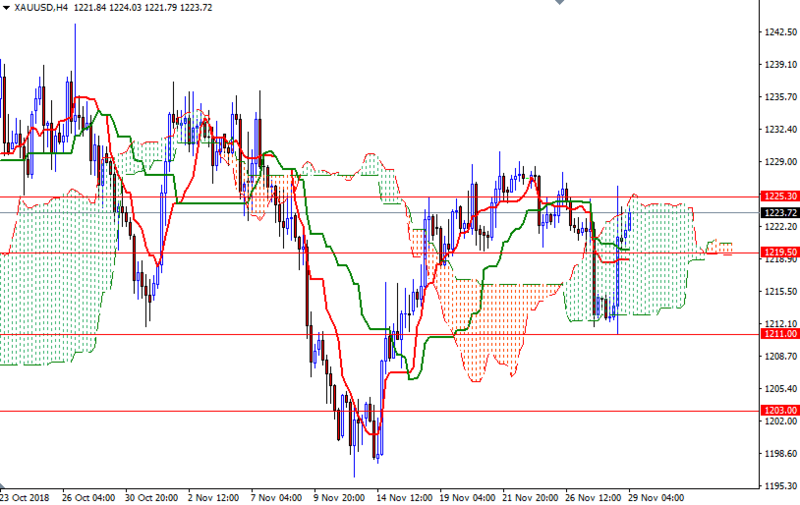 The top of the hourly cloud stands in 1220-1219.50 so the bulls need to drag prices below there to challenge 1217.80. A break below 1217.80 implies that we are heading back to 1216/5.